The temperature may be cooling down but that is simply an indication that many MLB teams are heating up. 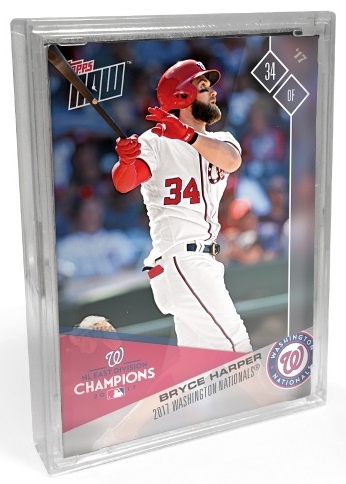 2017 Topps Now Baseball Postseason honors those who reach such feats with a team set. Much like the 2016 version, every team who plays beyond the regular season receives a spot in the 2017 Topps Now Baseball Postseason lineup. In addition to the 15-card base set, collectors also have a chance to receive a bonus card for every playoff series win. Meaning, the team who wins the 2017 World Series receives three "extra" cards, giving fans a total of 18 cards highlighting their team's success. Shop for 2017 Topps Now Baseball Postseason Sets on Topps. 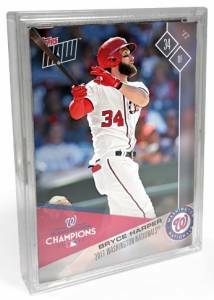 However, unlike the main 2017 Topps Now Baseball selling period of 24 hours, the window of opportunity to purchase a postseason set remains the same, no matter when a team clinches a playoff berth. A single 2017 Topps Now Baseball Postseason team set is priced at $49.99, and $399.99 for those who wish to purchase 10 team sets. There is also an autograph edition that offers a signed card, selected at random, in addition to the full base set. However, collectors should be aware that not all teams offer autographs, and prices vary by team, starting at $74.99 for the Cleveland Indians and going up to $119.99 for the Yankees. All autographs are numbered to less than 100 copies and every signer has each version: #/99, #/49, #/25, #/10, and 1/1. The exception for this comes from the Yankees' rookie phenom. Aaron Judge autographs are limited to just 36 copies, with only versions #/25, #/10, and 1/1. The online exclusive is sold until October 7, but the autograph editions are available as supplies last. As usual, all options include free SmartPost shipping through the Topps Online Store. Check back as we will add new team sets to the checklist, along with other details. 2017 Cleveland Indians Postseason Topps Now 15-Card Team Set - Only 776 Sets! At least 15 cards per set. View available Now Postseason sets on Topps. Print runs (PR) and bonus cards will be added when known. Team checklists subject to change until finalized after October 7. Signed sets include 15 base cards and 1 random autograph. Autograph Versions: #/99, #/49, #/25, #/10, 1/1. Final print run is 130 sets. Final print run is 423 sets. Final print run is 889 sets. Final print run is 776 sets. Final print run is 54 sets. Final print run is 430 sets. Final print run is 879 sets. Final print run is 86 sets. Final print run is 920 sets. Final print run is 171 sets. View our related guides for more information on 2017 Topps Now Baseball cards.